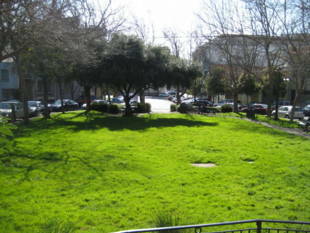 This park is in the heart of the SOMA neighborhood. It has a small playground with recent improvements. It also has a sand pit and some unique climbing structures. There are plenty of paths and picnic tables to enjoy and appreciate your surroundings. This park is well-kept and has a ton of beautiful trees and bushes that surround the park. Dogs are welcome too! There is plenty of space for your pup to run around and play fetch! After a nice afternoon at South Park, head over to one of the cafes or restaurants around the perimeter! 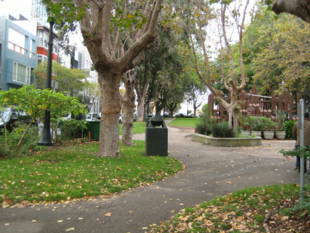 South Park is owned by the San Francisco Recreation and Parks Department. 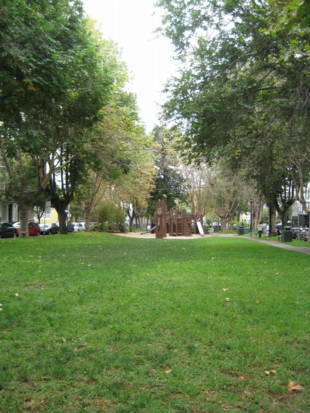 The Park is in the middle of a block bordered by 3rd, 4th, Bryant and Brannan, and there are roads (Jack London Alley and South Park Avenue) that lead into the park from each of those streets. Construction of the two-story homes began swiftly, accompanied by the development of the oval garden in the center of South Park. It rapidly became an elite address in its early years, until the infamous 'Second Street Cut' in 1869 connected Second Street to the waterfront and made the area accessible to the working poor. With the influx of new neighbors, the park gradually lost its popularity and cachet with the city's wealthy residents. In 1897, the city acquired the site and established it as a public park. In its first 45 years, South Park had been locked, and only those local residents who held keys had entrance. By 1906, the locks had come off and it was a working class community, with run-down but comfortable homes surrounding the well-used park. The earthquake and fire in that historic year virtually destroyed the neighborhood. Today South Park is a revitalized and highly desirable urban neighborhood with giant dot- com companies moving in next door to its architects, designers, shops and restaurants. A $50,000 grant from the Park Renaissance Campaign has financed the Friends of South Park's long sought and much needed improvement plan which included new lighting fixtures around the pathway, a new water fountain, and replacement of picnic tables, benches and trash receptacles --all highly important for the 500 people who flock into the park from surrounding businesses to eat lunch, every day. On Earth Day a volunteer corps from Rec and Park's School Stewardship and Volunteer Department came in and installed two hummingbird gardens, created a new native plant garden, and refurbished the existing one. Upgrading the Park's two run-down playgrounds generates controversy. 'They flunked Rec and Park's guidelines,' says Friends' Louise Bird, explaining that the equipment is antiquated and rusting and that the playground lacked disability access and a fence. She adds that in the park's small residential community there are not many children, and the surrounding businesses have little interest the playgrounds, now used principally by a nearby day care center. And, she notes smilingly, 'sometimes in the evening, by men in coats and ties, who jump into a swing on their way to dinner on the circle.' Friends have secured funding for a standard chain link fence, and they plan to raise money for the additional cost of making it a black, wrought iron one that would harmonize with the new fixtures and furniture. 'Funding and philanthropy' are the answer to the playground problem, Bird believes, and an overall plan is just a drawing board away. In 1852, an aristocratic Englishman, entrepreneur George Gordon, began buying up lots between Bryant and Brannan and Second and Third Streets, on what he described as the only level spot free of sand in the city. There, at the base of fashionable Rincon Hill, he designed and built South Park, San Francisco's first planned community. Modeled on the squares, ovals and crescents in London and New York City, it featured 68 elegant residences of uniform architecture circling a 550 ft. grassy oval park that was ringed by a locked ornamental railing. Only the homeowners had keys. A Dutch windmill in the middle of the park pumped water for residents who paid a monthly fee for maintenance of the property. Streets and sidewalks were the first in the city to be paved, and on sunny days, the park was crowded with white-uniformed maids watching over children at play. Home to many of the city's civic leaders, intellectuals, legislators and captains of industry, the area flourished as a wealthy enclave until 1869 when Second Street was built, cutting through the center of Rincon Hill to the waterfront and making the area accessible to the working poor. The wealthy migrated to Nob Hill and working class families moved in to enjoy the park and its sunny weather. In 1897, the city acquired the site, established it as a public park and removed the locks on its gate. In 1906 the earthquake and fire removed the neighborhood. After the fire, South Park was rebuilt into a motley collection of warehouses, machine shops, sleazy hotels and honky-tonks. An influx of immigrants--Japanese, Chinese, Filipinos, Mexicans, and African-Americans- was joined in the ' 30s by longshoremen. To warm themselves while waiting for calls from the Union Hall, they built a bonfire in the middle of the park. Noxiously, it burned for the next 40 years, furthering the park's decline into a dangerous slum abandoned by city planners. It was fed with construction refuse, neighborhood garbage and junk and the park became a gathering place for drug addicts and the mentally ill. The city provided them with wood so that they wouldn't demolish historic buildings for fuel. In the late ' 70s, when the low-rent site began attracting a few intrepid artists and other professionals, South Park began a turnaround. 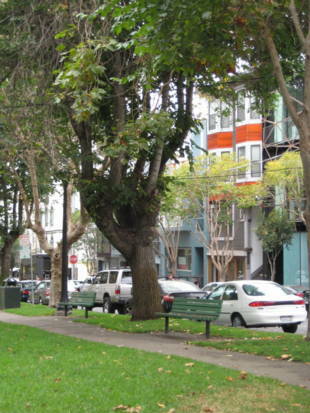 The architects, designers and photographers who moved into live/work spaces formed a South Park Improvement Association, and worked to evolve a European-style neighborhood. By the end of the ' 80s, it had become a mixed-use residential and commercial district with restaurants, businesses and retail shops (including several famous discount outlets for women's wear) on the ground floor, and apartments above. Fast forward to the 'irrational exuberance' of the dot- com explosion. In the mid- ' 90s South Park became 'the cultural hub of San Francisco's trendy interactive media district.' (New York Times). Rents zoomed skyward, new restaurants sprang up, as did their prices, artists and small businesses were edged out. The boom came to an end in 2000, and the park's retail and restaurant businesses hit hard times. By 2003, however, the neighborhood seems to be edging back. 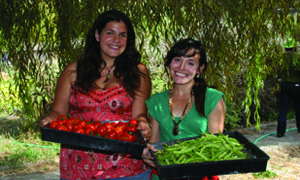 NPC is holding its second annual gala at the park on October 9th, hoping to attract visitors who may not have visited this unique neighborhood park. 'Vacancy' signs are decreasing and new people are moving in --architects and industrial designers, joining those who, like architect Toby Levy, stayed through boom and bust. In fact, Levy who has lived and worked at South Park since 1984, is expanding her studio and office. A grant from Rec and Park's Renaissance campaign funded new picnic tables, benches and lighting fixtures that were installed three years ago. Further improvements under Rec and Park's Capital Plan are on its ' 03-' 04 calendar, and at the district park planning meeting this month (September, ed. ), the community will discuss priorities and options. Friends of South Park's Louise Bird, a longtime resident, hopes that new residents in the neighboring apartments and high-rise buildings will attend the NPC gala and as the slogan says, 'Rediscover South Park on Thursday October 9th'. 'We want this to be a park for everybody in the community. It's not just for those of us living on the circle,' she declares.